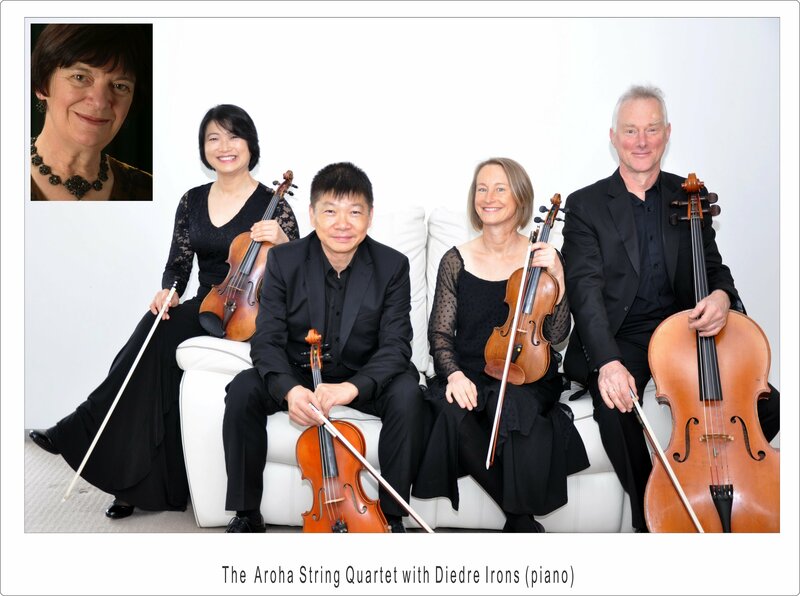 The Aroha String Quartet is firmly established as one of this country’s finest chamber ensembles. Haihong Liu and Zhongxian Jin are original members of this quartet that was founded in 2004. Robert Ibell joined in 2009 and Ursula Evans in 2017. Known for their musicality and multicultural innovation the quartet presents programmes ranging from classical to avant-garde to traditional Chinese music. As well as regular tours throughout New Zealand, they have travelled overseas to participate in festivals in Austria and Australia, and to China to give concerts and masterclasses. Committed educators, they run an annual week-long chamber music course in Wellington and an equivalent week-long course in China. For this concert they will be joined by the amazing Diedre Irons, a pianist who is much loved and admired by New Zealand audiences. The programme opens with Mozart’s ‘Hunt’ Quartet, so nick-named because of its opening theme, a jaunty 6/8 ‘horn-call’. The Mozart, cheerful and elegant, is followed by Unbound – a work by New Zealand composer Brigid Bisley.